I felt like I had a disproportionate number of “almosts” this year–plenty of wonderful singing, playing, conducting, directing, etc., but almost every performance came with a serious caveat that some other element was seriously lacking (e.g., I loved Christopher Alden’s production of Così at the City Opera, and the cast was overall quite excellent, but the orchestra was oy). So it usually goes in opera. While my “best performances” list is short, tons of great stuff didn’t fit in here here–Nina Stemme’s Brünnhilde! Christian Gerhaher! The Makropulos Case! But if you want to see what I have to think about any of them, well, read the archives of this blog, because if I relived everything this would be really long. On that note, I had best proceed. Serse (Komische Oper): Who knew that Regietheater wizard Stefan Herheim would turn into Mel Brooks when attempting Baroque opera? This production had a joyous and knowing attitude towards opera, and super performances from the Komische Oper ensemble. Some of it was a little recycled, but that was kind of the point, and I’ve actually found myself describing it to explain how Baroque opera works, it’s that spot-on. This production needs to be on DVD, so I can watch it whenever I’m feeling sad about life. Der Ring des Nibelungen (Bayerische Staatsoper): A modest Ring for unsure times, it suggested that in the end all we need is love. Fair enough, for the Ring. While sometimes too minimal for me to have strong opinions about (until a somewhat discordant, blaringly ideological Götterdämmerung), it did have a quiet poetry, and some achingly earnest performances from Anja Kampe, Nina Stemme, and Wolfgang Koch, and the entire cast did the text and drama proud. Even without directly comparing it to the Met’s DOA Lepage Ring, it had palpable life. 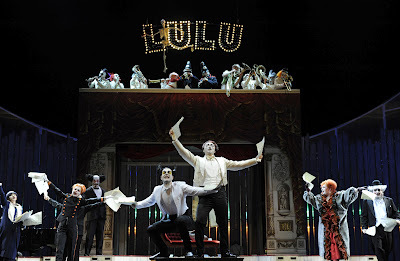 Lulu (Semper Oper Dresden): A scintillating performance by Gisela Stille in the title role, Cornelius Meister’s eloquent conducting, a marvelously committed cast in… another Herheim production, this one with some seriously scary clowns. I know I’m boring by just praising him all the time, but his work has a way of growing and gaining coherence in your memory as time passes, as you make sense of it for yourself. Anja Kampe (Sieglinde, Die Walküre, Bayerische Staatsoper) Such raw, vivid expression! My offer of a year or two ago to found an Anja Kampe Fan Club still stands. Anna Netrebko (Mimì, La bohème, Salzburg) The perfect role for her lush voice and earnestly vivacious presence. Elina Garanca (Sesto, La clemenza di Tito, Met). I never thought I would say that! Very elegant. 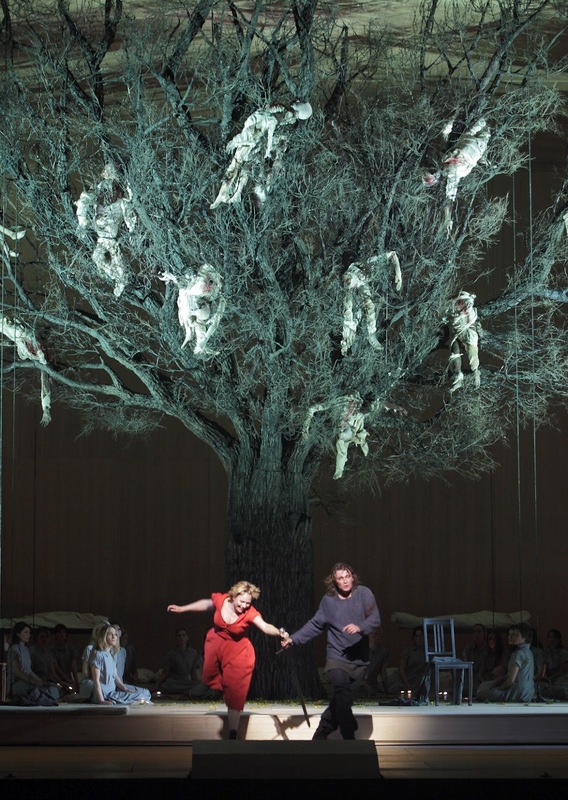 Simon Keenlyside (Wozzeck, Wozzeck, Munich and Bayerische Staatsoper) Terrifying. Bryn Terfel (Wotan, Ring, Met) There was more to one of his monologues than to whole acts of Lepage. Waltraud Meier (Waltraute, Götterdämmerung, Met) There was also more to hers. A cameo that nearly redeemed the whole evening. Anna Caterina Antonacci (Cassandre, Les Troyens, ROH) Maybe the Trojans didn’t believe her Cassandra, but the audience definitely did. Jonas Kaufmann (Bacchus, Ariadne auf Naxos, Salzburg) Great singing with shamelessly bonkers acting. Fidelio (Dresden). The singing ranged from bad to really bad (Evelyn Herlitzius can be epic, but on this night she wasn’t), but this production has been hanging around since 1989. That’s a momentous date, particularly when you’re talking about Fidelio. 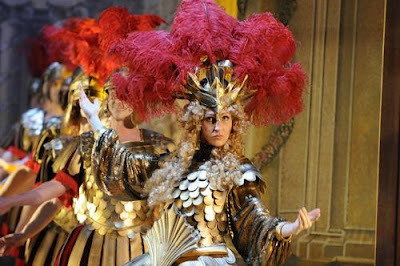 Video streaming on the internet from European opera houses. Unlike the Met HD broadcasts, these free, not that high quality productions (meaning the quality of the recording, not of the performance–the picture isn’t high def, the stage lights aren’t brightened for the occasion, and the sound can be a little tinny) aren’t aiming to replace the live opera experience (which is my biggest problem with the Met program, it teaches us to be numb to the virtues of liveness), and they make great, unique stuff accessible worldwide to people who would otherwise not see them. The leaders in this category are Brussels’s La Monnaie and Munich’s Bayerische Staatsoper. The TV channels Arte and Medici also produce webcasts, which tend to be very high quality but often have regional restrictions (though sometimes you can find these, ahem, elsewhere–big thanks to those kind souls who disseminate things like the Bayreuth Parsifal and La Scala Lohengrin, both of which I loved). Let’s hope for a great 2013! I think you mean Kirill Petrenko under best conductors, not Mikhail? Or am I confusing the two now, instead of you? I don't know whether this website works for foreign viewers without a proxy, but it's worth a try! I can't recommend it enough; I saw it in the house, went back a second time and would have gone again if I'd had the time. It's one of the most beautiful productions I have ever seen. "…operagoers are generally educated and curious people accustomed to films and books that are drastically more sophisticated that the kinds of things going on at many American opera houses. " I love the categories you've used for this 2012 summary — a really informative and engaging post. Thank you! I'd love to see a similar post from you forecasting the productions/performances you're most anticipating in 2013. For me, they're the Met's new Parsifal, Opera National du Rhin's continued Janacek cycle (Cunning Little Vixen and From the House of the Dead), Salzburg's Herheim Meistersinger, and perhaps Paris Opera's Elektra in Nov.
Antonacci and Garanca were truly excellent – and I would add Kate Lindsey to the "Names to watch" list too! Can someone please tell me how to access the video streaming from the European opera houses?